Three other people have been shot and injured. FOUR PEOPLE HAVE died, including the suspect, following a shooting at a Rite Aid distribution centre in northeast Maryland in the US, according to officials. 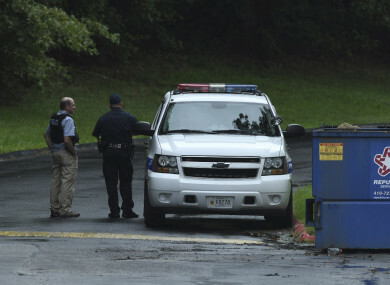 The attack comes nearly three months after a man armed with a shotgun attacked a newspaper office in Annapolis, Maryland, killing five staff members. The Harford County Sheriff’s Office has confirmed seven people were shot, including the shooter. It said that three people are expected to survive. There were two fatalities at the scene and one person later died at a hospital. The suspect was also fatally injured by a self-inflicted gunshot wound. The police received a report of shots fired at the Rite Aid distribution centre at 9.06am local time. Assets were on scene within five minutes, they said. The Harford County Sheriff’s Office has confirmed that the lone suspect was a 26-year-old female. Police said no shots were fired by any responding law enforcement personnel. Detectives are currently working to establish a complete timeline of the incident. Harford County Sheriff Jeff Gahler told reporters this evening that the assailant was a temporary employee at the distribution centre for the Rite Aid drugstore chain in Aberdeen, Maryland. Over the last several hours law enforcement has been actively clearing and searching the 210,000 square foot facility for additional victims and information. Gahler said the suspect lived in Baltimore County and the handgun she used in the attack, a 9mm Glock, was registered under her name. He said she was armed with the single handgun and several magazines. In a tweet, Maryland Governor Larry Hogan said his office is monitoring the situation in Aberdeen and that the state stands ready to offer any support. “Our prayers are with all those impacted, including our first responders. The State stands ready to offer any support,” he said. Susan Henderson, spokesperson for the drugstore chain Rite Aid, said the shooting happened on the campus of a company distribution centre in Aberdeen. She described it as a support facility adjacent to a larger building. With reporting by Associated Press and AFP. Email “Four people die, including suspect, following shooting in Maryland in the US ”. Feedback on “Four people die, including suspect, following shooting in Maryland in the US ”.